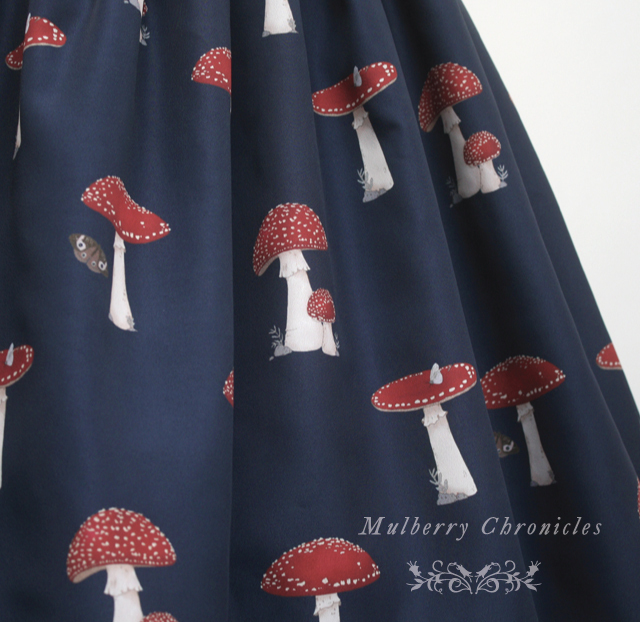 Dear Readers, here are details for Mulberry Chronicles' first original print dress series arriving 14th July 2015, 6pm AEST (this evening). 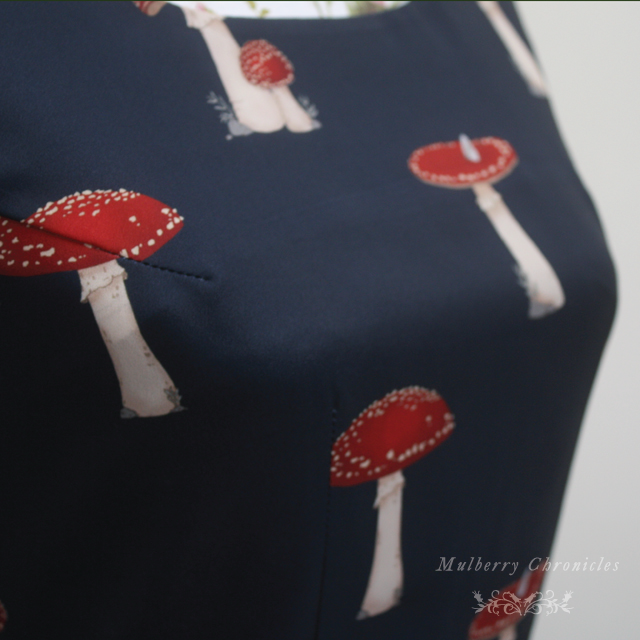 The Woodland Path jumperskirts are available in a rich navy ("Darkest Night") and blue-green ("Lichen") colourway. Both can be coordinated with white, beige, red, navy, pink, brown and wine. Elegant light pleats form a flattering silhouette with or without a petticoat. All items are in stock this evening and ready to ship during the week beginning July 27 2015. 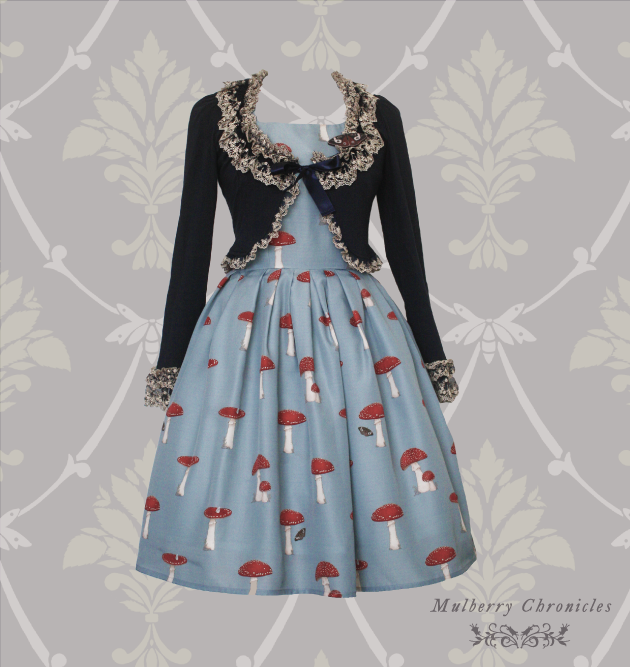 Coordinate with the Forest Moth and Toadstool brooch. 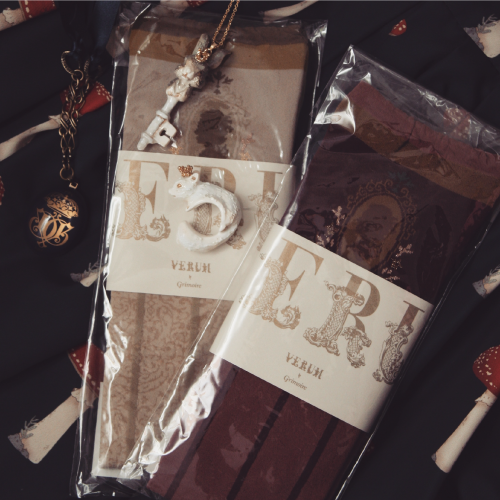 You can also add a whimsical touch (and make the most out of your shipping) with Grimoire Verum socks, tights and pendants or Tokimeki accessories from Chiffon Rose. 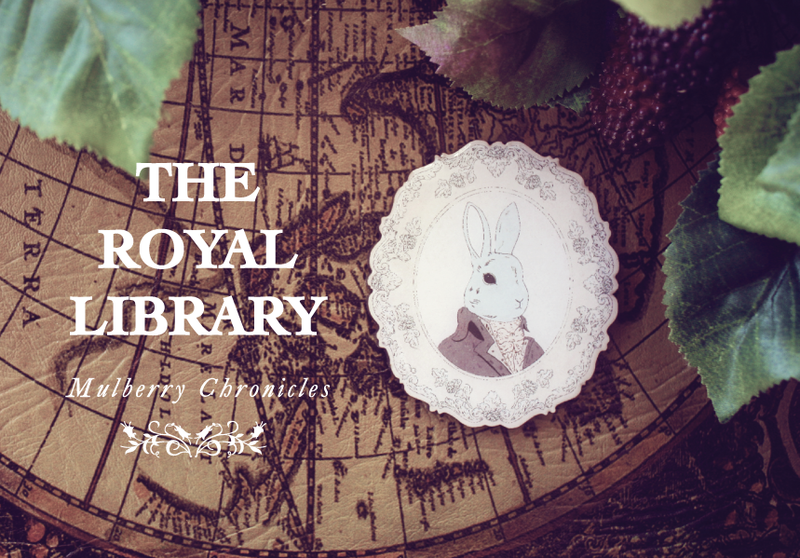 The Royal Library collection will also be restocked tonight: whimsical brooches of library treasures including books and portraits of the Rabbit Scholar and his cat. Are you "Lichen" or "Darkest Night"? Lichen reminds us that the forest is alive, full of creatures with their own worlds and stories. The elegant mystery of the Darkest Night intrigues the night-time wanderer. See you tonight at 6pm AEST! Mulberry Chronicles invites you to walk "The Woodland Path"
Mulberry Chronicles illustrated dress series The Woodland Path arrives on Tuesday 14th July 2015, 6pm AEST. 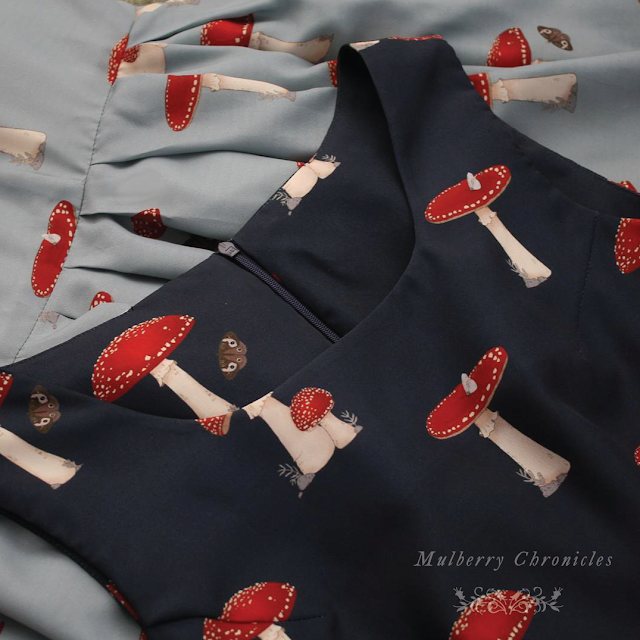 Mulberry Chronicles creates cute, wearable designs, combining whimsical motifs of the old world with modern fashion. 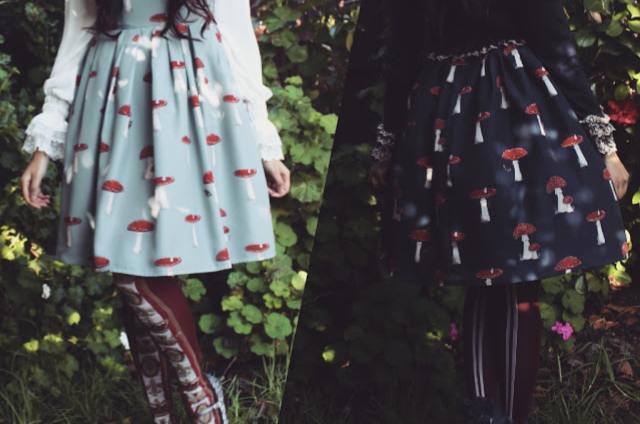 The Woodland Path series is constructed from an original illustrated fabric featuring toadstools and the occasional curious moth. 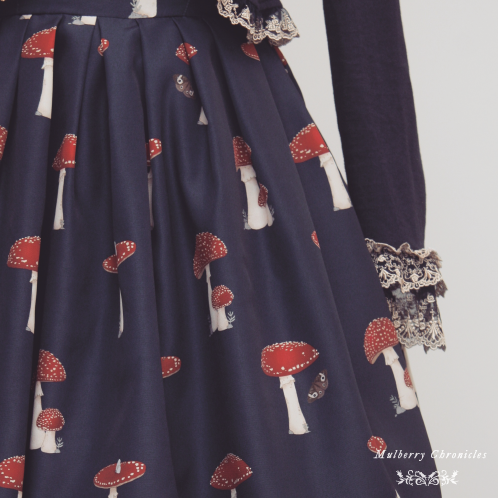 Close-ups on the "Dark Night" jumperskirt - a rich navy fabric dotted with vibrant toadstools and moths. 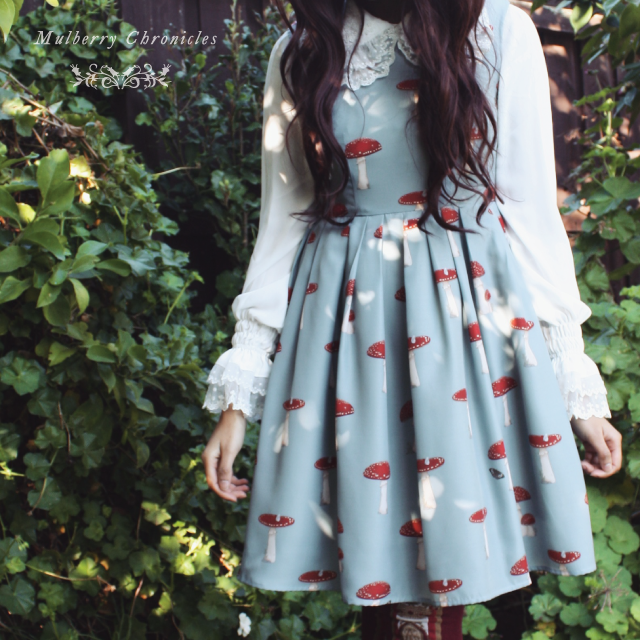 Dresses are illustrated, printed and ethically made in Australia. Size charts, accompanying accessories and other information will be provided early next week. Signing up to our mailing list will ensure you receive this information first. 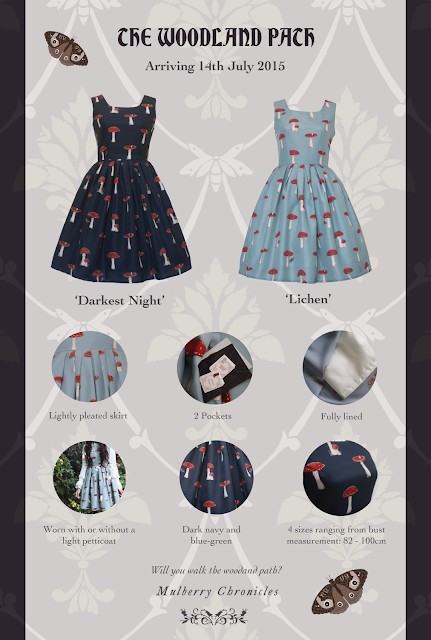 Thankyou so much for your support and interest in our dark forest tales, our in-house brand, the Mulberry Chronicles. 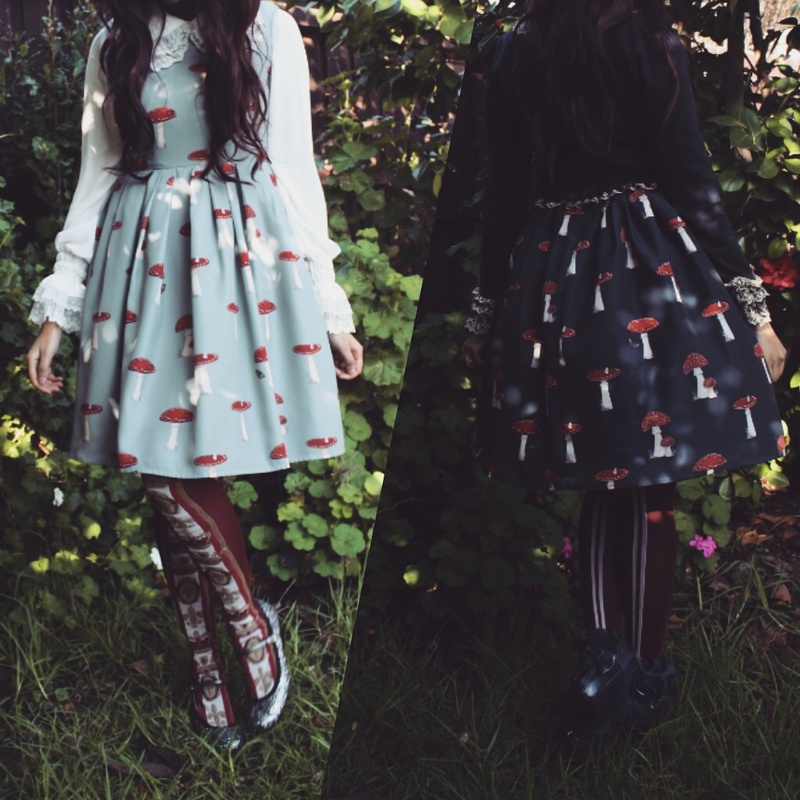 The Woodland Path arrives on Tuesday 14th July 2015, 6pm AEST.